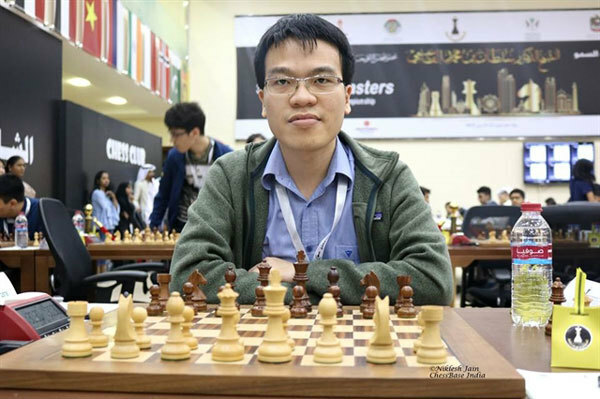 Top Vietnamese chess player Le Quang Liem has been named as an international super grandmaster again after a win in the standard category at the ongoing Dubai Open in the UAE yesterday. Liem (Elo rating of 2,697) beat Grandmaster Deepan Chakkravarthy of India (Elo 2,534) in the eighth match. With this win, Liem Elo’s will increase by 2.7, which is enough for him to return to the list of international super grandmasters who have Elo ratings of over 2,700. Liem had an Elo rating of 2,711, but was held by Yeoh Li Tian of Malaysia to a draw after 93 moves in the seventh match so his Elo dropped to 2,697. After eight matches, Liem ranks sixth out of 150 players with six points. Matlakov Maxim of Russia, Abdusattorov Nodirbek of Uzbekistan and Kuzubov Yuriy of Ukraine top the rankings with 6.5 points. Another Vietnamese player Nguyen Anh Khoi finished in 28th place. Liem will next take on Pichot Alan of Argentina (Elo 2,566) in the last match, while young talent Khoi will face Hedman Erik of Sweden.